Timbertech has made visualizing your dream deck a whole lot easier! We all have that dream deck envisioned in our mind. Personally, my dream deck has 2 levels, with three separate “rooms” and of course a spot for a hot tub! The more difficult part is figuring out what colors I want and how multiple colors look when used together. Well, TimberTech has a solution for that. 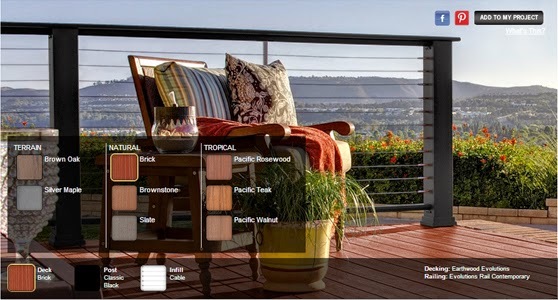 On every decking and railing product page, we have a large color visualizer. This allows you to get creative and change up the decking colors, as well as the railing colors and infill options. Use your imagination and visualize the perfect combination of decking and railing. Best of all – you can save the pictures and share them to Pinterest and Facebook! We also created an iPad app that includes color visualizers, so you can visualize your dream deck while you are on-the-go. So the next time your grabbing coffee with a friend, you both can design your dream deck. The TimberTech Deck Guide is available on the App Store – download it today! As you get creative with the TimberTech color visualizers – share your inspirational deck designs with us by posting them to the TimberTech Facebook page.